Even in the process of fading away, as old soldiers are expected to do, some notables among them manage to retain their spark for a long time. Lt Gen JFR Jacob was one such soldier. Having first donned a uniform at the tender age of 14 as part of the cadet wing of the Northern Bengal Mounted Rifles in 1937, he grew to love it so much that volunteering for the army was the next logical step. His exceptional military career started with service in an Anti-Tank Battalion in Iraq and the Arakan during the Second World War, and reached its pinnacle during the 1971 Indo-Pak war, in which he is considered one of the major architects of the Indian victory. Irrepressible throughout his service, the general was known always to have spoken his mind and stood up for what he thought was right. As a Major in the Artillery Directorate shortly after independence, he was ordered by the Master General of Ordnance to change the motto of artillery, ‘Izzat O Iqbal’, as it was in Urdu. Not convinced about the propriety of doing so, he stood his ground and convinced the general that there was no befitting Hindi equivalent that conveyed the same sentiment. Gunners continue to proudly wear the motto to date. Once, while attending the Staff College at Wellington, he was put up to the commandant by his instructor for a presumably uncomplimentary remark that Jacob, a war veteran, had made about the instructor, who had no operational experience. Instead of the severe dressing down that he was expecting from the commandant, he received sombre advice to ‘learn to suffer fools’ instead. Not that he could learn to do so right up to his retirement or thereafter. 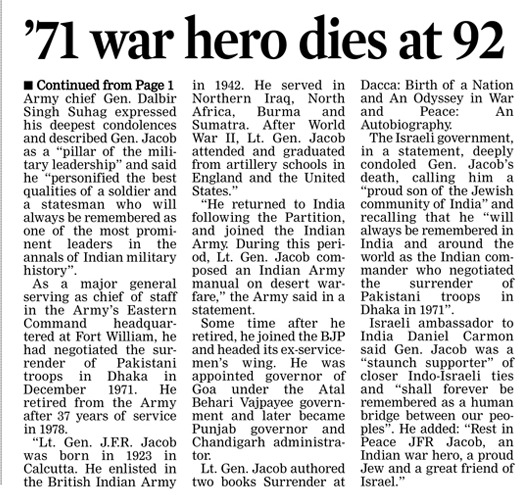 Brig KP Singh Deo, former Union minister and a veteran gunner himself, remembers General Jacob as “having his facts on his fingertips, besides being one of the finest human beings I have known. I had the occasion to interact with him as an officer many years his junior, and subsequently, when as a minister, I outranked him. He was equally courteous and kind. Someone who can treat his juniors with as much courtesy as he would a minister is truly remarkable.” Brig Deo recalls how Gen Jacob was instrumental in ensuring the 1971 war ended with a surrender by the Pakistani army rather than in a UN backed ceasefire as in the case of 1965. “We were poised to enter Dhaka, and the capital would have eventually fallen, but the Pakistanis were still capable of giving us a fight before that. 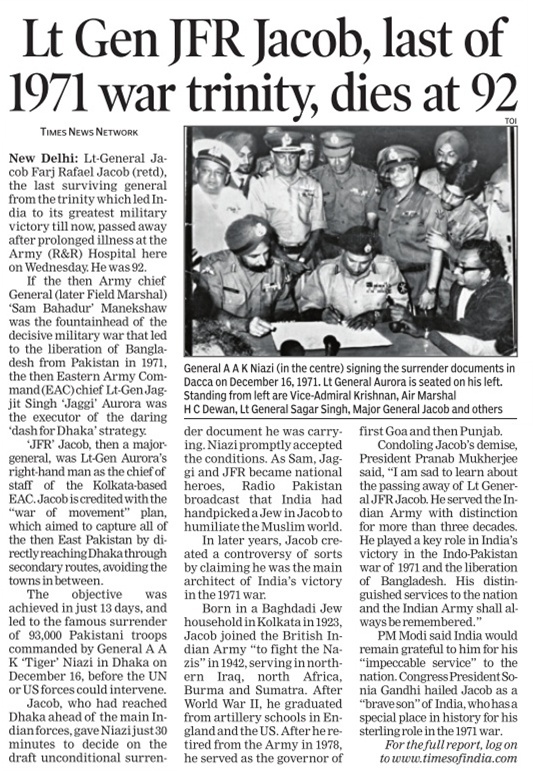 It was Gen Jacob, who met with Gen Niazi and psyched him into surrendering.” If the war had ended in a ceasefire instead of a surrender, 1971 would also have probably gone down as another stalemate with both sides claiming victory, as in the case of 1965. After his retirement, he served as the Governor of Goa and Punjab. Being a Jew, he had close personal and spiritual ties with Israel, which led him to play an active role in promoting Indo-Israeli relations. In him, the country and the army has lost one of its finest generals, an able administrator and an exceptional human being. Pakistan’s behaviour was identical, when the Lashkar-e-Taiba attacked Mumbai in November 2008, killing over 160 persons. We once again witnessed the spectacle of blatant and false denials of any Pakistani involvement by the ISI, till the media traced the home of captured terrorist Ajmal Kasab in Pakistan’s Punjab province. India has only itself to blame for the rise of the Jaish-e-Mohammed as a vicious terrorist organisation by releasing its leader, Maulana Masood Azhar, during the IC 814 hijacking in Kandahar. Interestingly, yet another terrorist, Omar Saeed Sheikh, whom India released during the hijacking of IC 814, was associated with the perpetrators of the 9/11 attack on New York and Washington also. Nations, and indeed the world, pay a high price when surrendering to terrorist demands. Even though a faction of the Jaish-e- Mohammed led by Masood Azhar is now back in favour with the ISI, the Jaish itself was in the ISI doghouse for years because of its association with the Pakistani Taliban, (Tehriq-e- Taliban). The relations of the ISI with the Tehriq-e-Taliban started to sour after Pakistani Special Forces laid siege to and attacked the Lal Masjid in the capital Islamabad, which was then run by Deobandi clerics, affiliated to the Jaish-e-Mohammed. The Jaish claims an ideological/sectarian affinity with the Afghan Taliban, who also label themselves as “Deobandi”. But, in the recent past, the ISI and the Jaish-e-Mohammed appears to have struck a deal, under which they will support each other in backing the Afghan Taliban and cooperate in terrorist attacks in Jammu and Kashmir and elsewhere in India. The link between the Jaish and the ISI helps drive a wedge between the Pashtun-dominated Afghan Taliban and their Pashtun Pakistani counterparts (TTP), who are now being targeted by the Pakistan army. 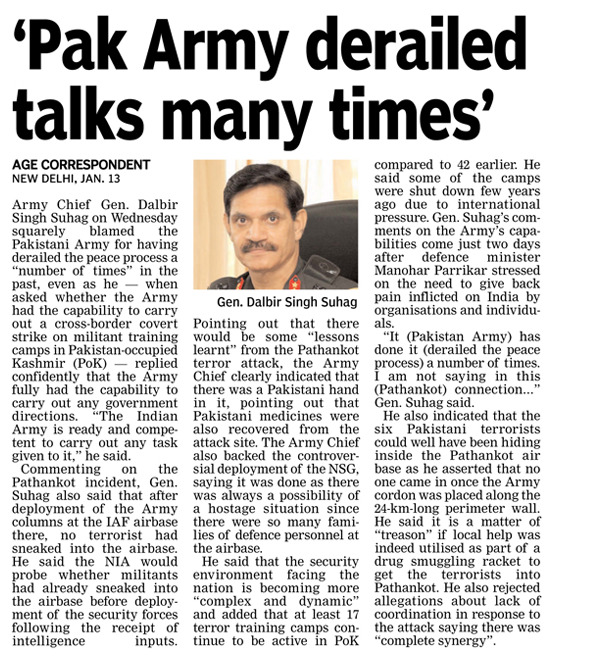 The involvement of the Jaish in the attack on the Pathankot air base has to be seen in this context. Pakistan’s support for the Afghan Taliban is reinforced ideologically by the Deobandi-oriented Jaish. The Jaish also provides additional muscle to the ISI-sponsored jihad against India. Maulana Masood Azhar, who was imprisoned in India before his release in Kandahar, has repeatedly vowed to wage jihad against India. While Pakistan may pretend to take some symbolic steps against the Jaish-e-Mohammed, it is unlikely to end support for the involvement of the Jaish jihad against India by acting seriously against its leaders. The fact that the investigation into the attack has been entrusted by Mr Nawaz Sharif to Pakistan’s toothless Intelligence Bureau, which is given to kowtowing before the army establishment, indicates that no serious action will be taken against the masterminds of the Pathankot attack. While the Obama Administration has called on Pakistan to act expeditiously against the perpetrators of the Pathankot attack, one has to realise that Washington is presently depending heavily on the Pakistan military to promote “reconciliation” between the Afghan Government and the Taliban. There is, however, little reason to believe that despite its pious professions, the ISI will do anything to prevent a Taliban takeover in Afghanistan. In these circumstances, India will have to actively utilise the bipartisan support it enjoys in the US Congress to see that the Obama Administration acts more decisively, by curtailing it military aid programme to Pakistan and asking its western allies and Japan to do likewise with their economic assistance. There cannot be business as usual unless Pakistan acts against the perpetrators of the Pathankot attack. New Delhi will have to take some hard decisions on how to proceed with the conduct of relations with Pakistan. Quite obviously, India needs to calibrate its engagement and dialogue with Pakistan, bearing these realities in mind. Alluding to the meeting that Prime Minister Nawaz Sharif had with Gen Raheel Sharif and others, the Pakistan government said on January 8: “The meeting discussed the Pathankot attack, expressed condemnation of this incident and reiterated the country’s commitment to cooperate with India to completely eradicate the menace of terrorism afflicting our region.” Pakistan is thus implicitly suggesting that it too has concerns on terrorism, allegedly sponsored by India. By all accounts, the National Security Advisers (reinforced by Foreign Secretaries) had a useful meeting in Bangkok. Several such meetings, preferably behind the scenes and devoid of publicity, are required if we are to reach an agreement on how to deal with concerns on terrorism. 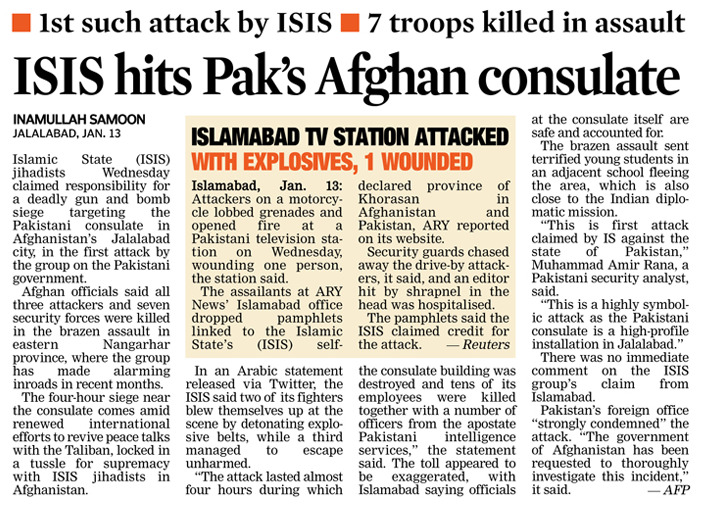 Similar meetings between the heads of intelligence agencies (ISI and R&AW) should reinforce these meetings. Working out the framework for a new Comprehensive Dialogue as proposed by External Affairs Minister Sushma Swaraj can be discussed in due course. Moreover, it is important that a mechanism for regular meetings between the DGMOs should be firmly in place before the winter snows melt and infiltration picks up in the Kashmir Valley. It is also time to activate measures to raise the costs for the Pakistan army internally for its support to cross-border terrorism. The Pakistan army is today engaged in suppressing its own people in three of its four provinces—Sind, Baluchistan and Khyber Pakhtunkhwa, bordering Afghanistan. These military operations should be made infinitely more costly for the Pakistan army in terms of men, material and finances. Dialogue has to be accompanied by the full spectrum use of “non-conventional capabilities” by India, as long as the ISI continues its policies aimed to “bleed India with a thousand cuts”. Army Chief General Dalbir Singh Suhag today rejected allegations about lack of coordination during operations to flush terrorists out of the Pathankot Air Force Station, saying local commanders had complete liberty in planning and execution. At a press conference in the National Capital, General Suhag said the Army was not under anybody’s command except the western Army Commander – Lt Gen KJ Singh. His statement assumes significance as retired Army officers had been questioning as to why the Army, the last resort of the nation, was put under the command of the National Security Guard, a force governed by the Ministry of Home Affairs. It is also being questioned as to who was in command of the Indian forces after they were deployed to tackle the January 2 terror attack. “As far as the Army is concerned, it was not under anybody’s command. It was under the Western Army Commander who was monitoring and controlling the operations on my behalf,” General Suhag said. The Army Chief also said “there was no lack of coordination, and there was complete synergy”. 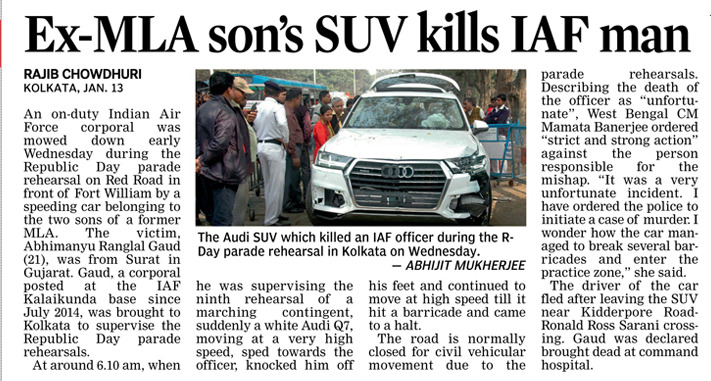 One of the focus areas was to ensure the safety of assets (planes and helicopters at the IAF base) and families at the attack site, for which a strong cordon had to be established, he said. He said it would be premature to elaborate on the “lessons learnt” till the National Investigation Agency probe was over. “How the terrorists got in despite the intelligence is being looked into by the NIA,” the Army Chief said. According to him, the terrorists used “gaps along the Punjab border” to enter the country and he termed the drug smuggler conduits helping terrorists as “treason”. General Suhag also defended the government’s move to send in the NSG. “Instead of moving the NSG later, it was wise to take preemptive action to send the elite unit in advance. 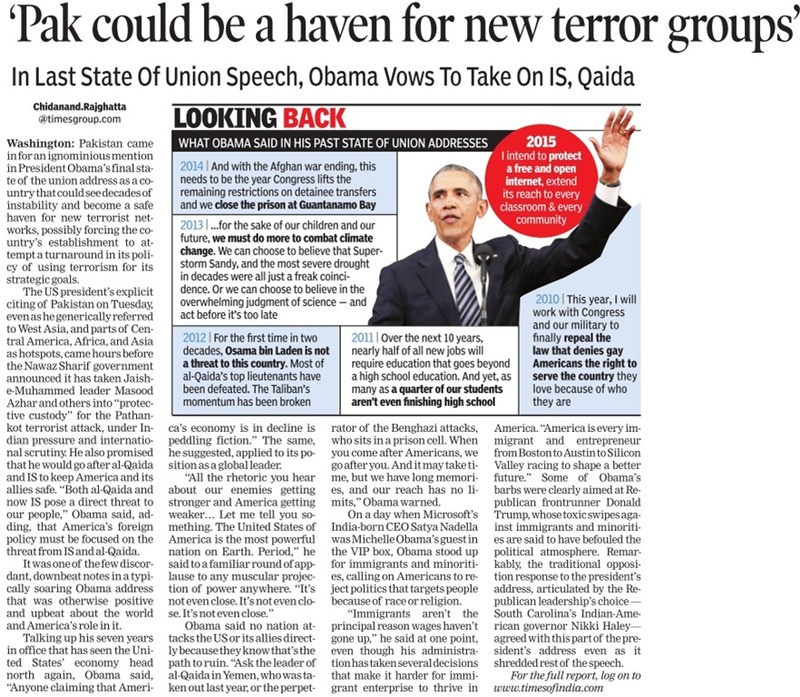 The NSG is ideally trained to tackle hostage situations,” he said. “A hotline between the Director Generals of Military Operations (DGMOs) of India and China is being set up,” said the Army Chief, adding that another border personnel meeting point was being discussed with China in the central sector – Himachal and Uttarakhand. Pakistan today arrested Jaish-e-Mohammad (JeM) chief Maulana Masood Azhar, his brother Abdul Rehman Rauf and “several individuals” belonging to the outfit and sealed JeM offices. While the arrest of “several individuals” was announced by the Pakistan Prime Minister’s Office, there was no official word on Azhar’s detention. Officials said Azhar and two other terrorists, who were released from an Indian prison in 1999 in exchange for 155 passengers of a hijacked Indian Airlines plane, had been taken into protective custody after raids on several JeM offices. The Foreign Secretary-level talks scheduled for this Friday appear unlikely despite the crackdown on the JeM. India believes the outfit was behind the Pathankot attacks. The office of Pakistan PM Nawaz Sharif stated that Pakistan was considering sending a special investigation team to Pathankot in consultation with India. Given the fact that Sharif has initiated some action in tracking the perpetrators of the Pathankot attacks, the sentiment within the Indian government seems to be to postpone the Foreign Secretary-level talks by a week or so, or have the National Security Advisers (NSA)s of the two countries meet first. An official decision is awaited. Foreign Minister Sushma Swaraj and Foreign Secretary S Jaishankar held a meeting this evening and updated the Prime Minister. The meeting was attended by Ministers of Interior and Finance, the Punjab CM, Adviser on Foreign Affairs, COAS, DG of ISI, Corps Commander Lahore, Director-General of Intelligence Bureau and other senior civil, military and police officials. Significantly, the meeting was also attended by army chief Raheel Sharif and Inter-Services Intelligence (ISI) chief Lt Gen Rizwan Akhtar. Pakistan’s proposal to send a special investigation team to India also stems from the fact that ‘additional information would be required’ to take any further action against the JeM. New Delhi: Minister of State for External Affairs and former Army chief General VK Singh on Tuesday hit out at Congress leader Manish Tewari saying his remarks about the 2012 troop movement row has cast doubts not only on Army's integrity but also of the government he was a part of, the then prime minister and the defence minister. Reacting to Tewari's recent claim that the reports on the troop movement suggesting a coup attempt could be true, he was using the bogey of a military coup and politicising one of the finest armies in the world. The Minister said that Tewari was "much too intelligent a person not to know what he was doing or saying and he is a lawyer too. "Let me also emphasise that by trying to get at me he has once again caused collateral damage to the 13 lakh strong patriotic force that protects the country", he said. Singh added, "In one stroke he has cast doubts not only on the integrity of this force but also of the government he was a part of and the then defence minister and prime minister - both men who are held in high esteem by his own party". "So please stop wasting the time of this country. There are too many pressing problems that need attention. Leave some of us alone to do our job," he said.